It all began one typical afternoon in Puget Sound near Tacoma on June 21, 1947. Salvage operator Harold Dahl was conducting business hauling in stray logs in for a finders fee when he and his crew, including his son, his dog, and two other men, spotted something strange in the skies above. Six massive objects appeared overhead, stunning the men and scaring Dahl enough to bring his boat to shore on Maury Island. The unidentified aircraft was described as donut shaped with large holes approximated 25 ft in diameter. What scared Dahl was the erratic behaviour displayed by one UFO in particular, which appeared to be struggling to stay in the air, descending rapidly from 2000ft to approx 500 ft above the water’s surface. The craft sputtered, rocked, and swayed, and Dahl feared it might crash into his boat. Thinking on his feet, Dahl grabbed his camera once safely to shore and began snapping shots of the scene before him. Another UFO descended to join the distressed craft and after a few minutes of hovering, it appeared that the first UFO was beginning to gather itself together. As the two ascended once more into the skies above, the first UFO let out a dull roar and began shedding what was described as light, silvery, ‘paper-like’ metal that fell in a shower around Dahl’s boat and into the surrounding waters and shore. Then, the second wave of debris began falling, this time dark and liquid, like molten metal that dried on impact with the beach, sizzling as it sank into the waters. The material struck Dahl’s son, breaking his arm as well as killing the family dog, who was promptly given a summary burial at sea. The initial report given by Dahl was received by his boss, Fred Crisman, with a fair degree of skepticism. But, giving Dahl the benefit of the doubt, Crisman ventured out to Maury Island the very next day, and reportedly had his own encounter with the same UFO’s seen by Dahl and his men. Crisman later described how he had been collecting samples of material he thought could have been dropped by the craft when he spotted a UFO in the skies. Crisman thought the craft was watching him intently as if it were intelligently assessing what the operator was up to. Crisman and Dahl would bring their story to a certain Ray Palmer, publisher of Amazing Stories Magazine and future founder of FATE Magazine. 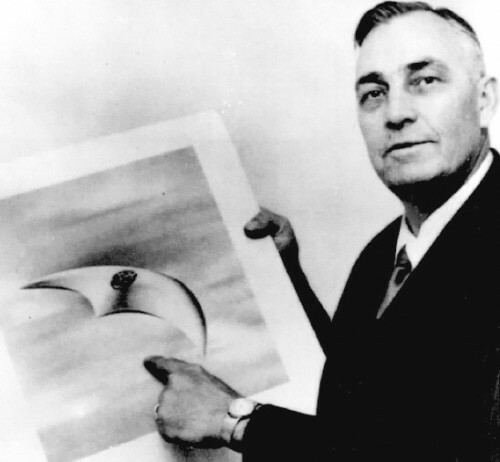 Palmer then contacted Kenneth Arnold, who had similarly had a UFO experience just days after Dahl and Crisman on June 24, 1947, known to most as the Mount Rainier UFO Incident. What happened next is one of the more bizarre instances in UFO history, and possibly represents the first case of Men in Black. Arnold flew down to Tacoma to meet with Crisman and Dahl. On his flight Arnold reported a second sighting of his own seen from the cockpit of his plane: 20-25 objects were seen flying approximately 400ft around him. Interviews with both men were scheduled to take place in the Winthrop Hotel in Tacoma, and once in session something strange began happening. Anonymous phone calls were placed to local media divulging intimate details about the incident, names of individuals involved, and what was said during the course of the private interviews. Paul Lantz was on the receiving end of these calls, about five in total over the course of a few days. Initially, Arnold was unconvinced by the story put forth by Dahl and Crisman, and even less convinced by the ‘evidence’ they presented him with, which was really just a bunch of rock material placed inside a cereal box (real classy, guys). So Arnold decided to contact two Airforce pilots by the name of Brown and Davidson, who were actually counter-espionage agents. The two agents flew out the next day to investigate for themselves and conducted secondary interviews with Crisman and Dahl who repeated their story in earnest. Some investigators suggest that there was a massive amount of mistrust between all parties involved at the Winthrop Hotel, which only hurt the legitimacy of the report and the subsequent investigation. Dahl, in particular, was mistrusting because of an incident that followed the days after his Puget Sound sighting involving a mysterious man who seemed to know too much about what he had witnessed. Some investigators point to this instance as one of the first modern encounters with the Men in Black phenomenon. MIB figures usually arrive in the wake of a spree of UFO sightings or other paranormal events, and the methods they employ usually center around intimidating witnesses into silence about their experiences. Others encounters are much more bizarre, random, and pointless in some accounts, but in all cases, the MIB appear to be absolutely out of this world. Dahl’s case was a classic Men in Black instance when viewed from this perspective but seemingly did not accomplish its purpose of keeping Dahl quiet. The events at the Winthrop Hotel set in motion a few complications. First, the material Crisman had collected was taken by the Airforce agents in order to be analyzed back at the Hamilton Air Force Base. Second, the agents would never arrive at their destination, and the material in question would become embroiled in a subsequent investigation around what caused the agent’s plane to malfunction and crash, killing both Brown and Davidson in the first ever non-war fatalities of the Air Force. These complications put Crisman and Dahl in the hot seat of the official investigation. The two men were repeatedly interviewed and interrogated about their story until they cracked. Dahl at one point recanted his story, admitting the entire thing was a hoax, only later revealing that he did not want to be further implicated with the incident and the investigation. 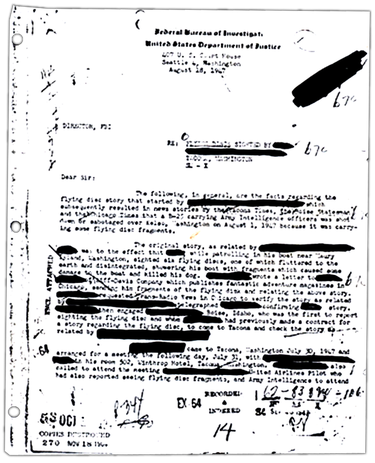 These reversals have been interpreted by some as a defensive mechanism on Dahl’s part; similar to many UFO witnesses that come out of the shadows, Dahl seemingly regretted his actions and wished to distance himself from the whole experience. Crisman was less apologetic. While he was similarly intimidated by the official investigation to recant his story under threat that he would be charged with fraud, Crisman never fully recanted. However, Crisman’s reputation was less than stellar as a sensationalist. Many paint Crisman as a ‘nexus’ of conspiracy and paranormal events. Long before the Maury Island Incident Crisman supposedly reported an encounter with strange subterranean monsters which he battled in a cave while fighting in WWII, a story that he sent in to Amazing Stories Magazine - founded by the same publisher (Raymond Palmer) who went on to report on the Maury incident and also later founded FATE magazine. Some even suggest that Crisman was involved in the Kennedy assassination, that he was a plant by the CIA. In fact, Crisman was actually subpoenaed by Jim Garrison in the 1960’s to testify in the case against Clay Shaw. Until his death in 1975 Crisman was continuously put under the microscope by conspiracy investigators, CIA, FBI and other independent researchers. Since he is no longer with us to defend his statements and actions, I leave judgement up to the reader in the case of Crisman. The complications of the Air Force plane crash threw a whole new light to the Maury Island Incident. Some investigators believe that the slag material being transported by the agents could have caused the crash itself, either by reigniting and causing a fire to break out in the cabin or by interfering with the control switches of the plane due to the magnetization of the material, which would have been devastating. The plane took off from Tacoma and within twenty minutes had crash-landed in the forest near Goble Creek, just north of its destination in Hamilton. The wreckage was treated as a ‘military exercise’ and was quickly and quietly cleaned up by over 300 volunteers. 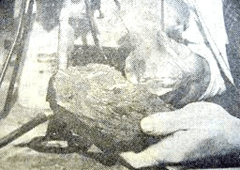 The slag material was never reported as recovered. 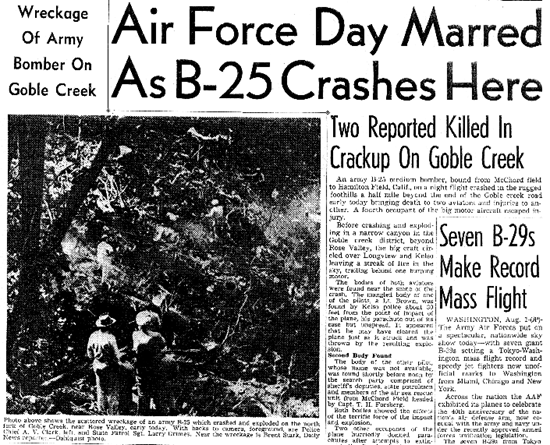 Before the clean up had commenced, more mysterious phone calls were received by the media in Tacoma detailing the crash and the victims twelve hours before it was publicly announced. Investigations into the Maury Island Incident continue to this day. UFO magazine reporters took up the case in 2014, digging up little in the form of new evidence. The investigation did bring out a living relative of the deceased Air Force agent Frank Brown, whose great-nephew revealed that his relative was actually a counter-espionage agent whose dog tags were given to Kenneth Arnold after his death. The location of the tags is unknown at this time.